I found a website that provides you with the published version of the Flash player and the version of Actionscript the swf was built in. This is useful when you are given a foreign swf file and need to determine which Actionscript/Flash player version the file is created in. All you need to do is to upload the swf file from your desktop or an online source. 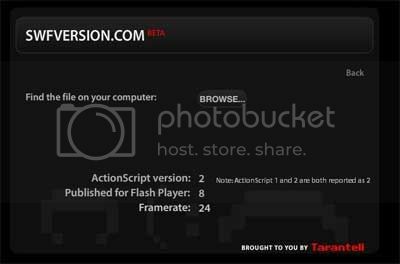 And the Actionscript version and Flash player version will be displayed.